Now with fixed maps - nice installment of the series! This installment of the Sinking-mini-modules clocks in at 21 pages, 1 page front cover, 1 page SRD, 1 page editorial, 1 page ToC, 2 pages of advertisement, 1 page back cover, leaving us with 14 pages of content, so let’s take a look! Now via the lost tunnels in the Vulgrax’s old holdings, the PCs may penetrate the fortress of the Malchort -however, they will have to succeed in elementally-themed challenges – from freezing cold subterranean lakes with sea serpents, magma lakes etc. – the challenges per se are simply awesome and at this point, I’ve seen *A LOT* elemental shenanigans: They actually require brains as well as brawns to solve and e.g. challenge the player’s logic with an AWESOME poem/light-based puzzle. Better yet, the problematic map-glitch that rendered one puzzle unwinnable has been fixed – kudos! 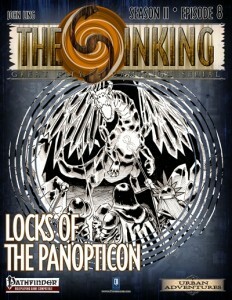 Finally bypassing a crystal dragon and dread undead guardians, the PCs can penetrate the panopticon through the Darkgate…where the final chapter of The Sinking awaits! Editing and formatting are good – since the map-glitch has been resolved, no particularly crucial mistakes remain.. Layout adheres to a 2-column b/w-standard and the pdf comes with cool, original b/w-artworks and 0onegame’s great cartography. The pdf comes extensively bookmarked for your convenience. Author John Ling cares about this module and one can see why. He has delivered an array of solid challenges, which, while in theme being of the “been there, done that” type, in execution, panache and flair more than make up for the classic theme. I love it if players need to use their brains as well. The elemental challenges herein proved to be surprisingly neat and this module with its low price point and now fixed maps may not stand as the best in the series, but it is definitely a good module. My final verdict will clock in at 4 stars.